LockDown Sow N Heat is an excellent product for attracting boar. Powerful enough to draw any boar to your hunt! 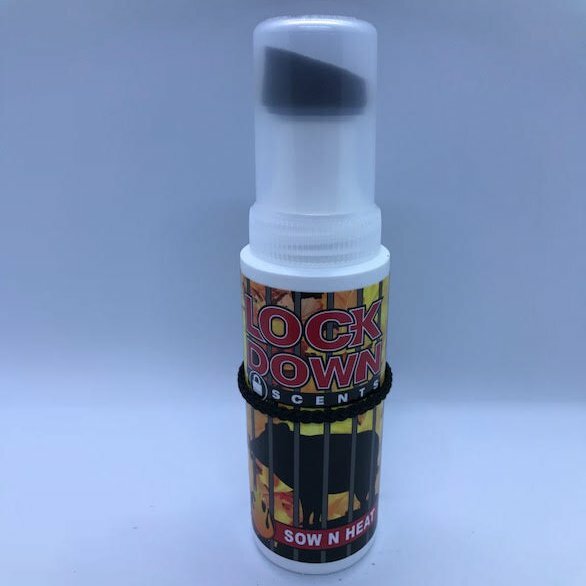 LockDown Sow N Heat uses an easy but effective scent delivery system. To use, simply remove cap and apply pressure onto a surface to activate the sponge applicator. Next, wipe the sponge on trees, rocks, stands, or anything else in your hunting area. After application, hang the bottle in your hunting area with the attached cord. The sponge will constantly wick scent into the air. After use, wipe the sponge clean and replace cap. Contains 100% US farm raised sow in heat urine. LockDown Sow N Heat Urine works well as both an incredibly powerful scent cover and as a lure.